"Plattsburgh" redirects here. For the neighboring town of the same name, see Plattsburgh (town), New York. For other uses, see Plattsburgh (disambiguation). Plattsburgh is a city in and the seat of Clinton County, New York, United States. The population was 19,989 at the 2010 census. The population of the unincorporated areas within the Town of Plattsburgh was 11,870 as of the 2010 census, making the population for the immediate Plattsburgh region 31,859. "The Lake City" "(La Ville sur le Lac)" "The Burgh"
Location in Clinton County and the state of New York. The city of Plattsburgh is within the boundaries of the original town of Plattsburgh and is in the North Country region of the U.S. state of New York. The city of Plattsburgh is the population center and county seat at the heart of the Plattsburgh micropolitan statistical area (MSA) - population 82,128 as of the 2010 Census. A statistical area representing the greater Plattsburgh region (as defined by the U.S. government), the Plattsburgh MSA includes all communities in the immediate Clinton County area. Beginning with Samuel de Champlain's expedition into the Lake Champlain valley in 1609, the Plattsburgh region began to come under the French influence, and later passed under British, and finally American control. The early French contact and its closeness to Quebec made this a historically French area. Located in the extended fur trade network in the Montreal hinterland, the Plattsburgh area was the realm of the coureur des bois, who served the larger trading hub in Montreal. Although Plattsburgh is a relatively new city, the surrounding area was settled during the mid-to-late 17th century. A permanent French settlement was hampered by the threat of conflict with the Iroquois, but French missionaries began living among the indigenous population as early as 1609. Moreover, the area near Plattsburgh is notable for being the site of an indigenous village. The local Catholic Churches also used to be run by Bishops of Quebec until 1808, when they were transferred to American Pastoral Care. As of 2013, trends are forcing Catholic churches and schools to consolidate. Plattsburgh and much of the lands comprising present day Clinton County were originally part of the French settlement of New France. They stayed a part of New France until the outcome of the French and Indian War, where the French lost their hold on this region to the British. This conflict (1754–1763) predated the American Revolution (1775–1783). As a condition of the 1763 Treaty of Paris, a vast region including present-day Plattsburgh was ceded from France to Britain. It was incorporated into British rule as part of the Indian Reserve. The Reserve was established by Britain as an attempt to protect British colonial positions in New England and the Middle Colonies using the newly acquired lands to buffer against armed conflict with Spain. The founding of present-day Plattsburgh, however, was not an act of the British, rather it coincided with the American territorial acquisition after the American Revolutionary War; ended as per the agreement between the newly established United States of America and Great Britain via the 1783 Treaty of Paris. Plattsburgh was founded by Zephaniah Platt in 1785 after he was granted the land by George Clinton. In granting land to Zephaniah Platt of Poughkeepsie, New York - who went on to establish the new city of Plattsburgh to buffer emerging American interests in the Saint Lawrence River valley and Lake Champlain valley after the American victory in the American Revolutionary War - the centralized American authority proclaimed the area including and surrounding the old French trading areas and Iroquois settlement to be refounded as the settlement of Plattsburgh in 1785. Part of the French Canadian influence in this Plattsburgh Region, however, was due to the fact that it saw several waves of Québécois Immigrants given it’s close proximity to Montreal during the decades of the Quebec diaspora. Local residents exercised their unique French culture and history over the years in ways still visible today. In Plattsburgh, for example, there is no "Main Street" - a common vestige of English colonies, whereas in a unique tradition major streets and thoroughfares were named after the daughters of prominent businessman and politicians (e.g., Catherine, Margaret, present day North Catherine and South Catherine Streets, and Plattsburgh's "Main Street", Cornelia St.). In a similar fashion, local residents named local streets after renowned Frenchmen including Samuel de Champlain, the region's founder, and General Louis-Joseph de Montcalm - the French general who gained fame defeating incredible numerical odds in battles throughout the Oswego and Hudson River Valley areas before going on to organize the last French defense of Québec at the Battle of the Plains of Abraham. The oldest monument within the city limits is dedicated to Samuel de Champlain. The village incorporated as a city in 1903. With its significant location on a major water thoroughfare and close to the Canada–U.S. border, Plattsburgh has been the site of a number of historic events including the Revolutionary War's Battle of Valcour Island and the War of 1812's Battle of Plattsburgh; the city has a War of 1812 museum. The Battle of Plattsburgh is significant as it was the final battle between the British/Canadian forces and the American (a feat that was made prominent given the battle was a flout of no less than 9,000 United Kingdom and Canadian forces compared to a force of 1,500 American regulars and 1,900 New York and Vermont militia) – for references see Battle of Plattsburgh. Plattsburgh Normal School was founded in 1889. It burned in 1929, and relocated to City Hall for three years. In 1932 the college moved into the current Hawkins Hall which became the base of the modern campus. In 1948 it became State University of New York at Plattsburgh. In 1915, the Preparedness Movement established the first and best-known of its training camps for prospective military volunteers at Plattsburgh. The "Plattsburgh camps" trained about 40,000 potential Army officers in the summers of 1915 and 1916. During the Cold War, military functions took a prominent role in Plattsburgh, which was home to Plattsburgh Air Force Base (PAFB) and was the location of the Strategic Air Command's primary wing on the U.S. East Coast due to its geographic desirability. The base's location in the Champlain Valley (protected by the rain shadow of the Adirondack Mountains) ensured consistent, year-round weather that was safe for take-offs and landings. The 380th Bombardment, Aerospace, and Refueling Wings, all stationed at PAFB, included B-52 Bombers, air-refueling "tankers" and FB-111s. The base had a great deal[clarification needed] of land surface and was one of only four military bases in the United States with a landing strip large enough for a Space Shuttle landing. A B-47 bomber with the inscription "Pride of the Adirondacks", one of two aircraft on display in the Clyde A. Lewis Air Park. On September 1, 1961, the 556 Strategic Missile Squadron was activated at Plattsburgh AFB. The Squadron consisted of 12 Atlas "F" Intercontinental Ballistic Missiles stored in underground silos at 12 sites surrounding the city of Plattsburgh. Ten of the silos were in New York, two across Lake Champlain in Vermont. The squadron played an active role in the 1962 Cuban Missile crisis, giving President Kennedy a powerful negotiating tool in dealing with Nikita Khrushchev. The 556 SMS's life was relatively short lived since the Atlas was a liquid fuel system that was expensive and difficult to maintain. As the solid fuel Minuteman ICBM began to come on line, the liquid fueled missiles such as the Atlas and Titan were retired. The 556 SMS began inactivating in the spring of 1965, completing that task later that year. Despite its numerous awards for performance excellence, PAFB was closed on September 29, 1995, in a round of national base closures in the early 1990s as the Air Force began to pare down its post-Cold War missions. The base property is now managed by the Plattsburgh Airbase Redevelopment Corporation (PARC) and is used by a number of industrial manufacturers and commercial airlines. Plattsburgh remains a favorite tourist location for vacationers from Montreal and southern Quebec. Bilingual signs, in English and French, are found in parts of the city. Today, the city relies largely in part on new industries with a predominantly Canadian and Québécois influence expanding on the former airbase as well as established manufacturing plants, such as Bombardier, Nova Bus, and Georgia-Pacific paper plant. The GP plant is housed in the former LOZIER Auto factory built in the early 20th century on the lakefront. Michael P. Anderson, one of the seven astronauts who died in the Space Shuttle Columbia disaster. Dave Annable, actor, attended college at SUNY Plattsburgh from 1998 to 2003, and earned his degree in 2009. Jean Arthur (1900–1991), comedy actress of the 1930s and 1940s and the star of her own CBS television series in 1966, The Jean Arthur Show, was born in Plattsburgh and lived there from 1900 to 1903. Rockwell Blake, world-renowned operatic tenor and first recipient of the Richard Tucker Award, known for his roles in the Bel Canto operas, was born in Plattsburgh. Jesse Boulerice, retired NHL hockey player, was born in Plattsburgh. Tom Chapin, Grammy-award-winning singer-songwriter, graduated State University of New York at Plattsburgh. John Henry Hopkins Jr., author of the well-known Christmas carol "We Three Kings", was rector of Plattsburgh's Trinity Episcopal church from 1872 to 1876. John White Moore, Rear Admiral of the United States Navy, noted for his service in the American Civil War and the Spanish–American War. Bryan O'Byrne, character actor, was born in Plattsburgh, attended St. Peter's Elementary School, Plattsburgh High School, and graduated from Plattsburgh State. David A. Stafford, Brigadier general in the United States Marine Corps. Daniel Stewart, first openly gay elected mayor in NY State History. In office 2000–2006. Rick Tuttle, Freedom Rider and Los Angeles City Controller. John Lloyd Young, Tony Award winner who played Frankie Valli in the original Broadway cast of Jersey Boys, Clint Eastwood's eponymous film based on the play, and Member of the President's Committee on the Arts and Humanities (appointed by Barack Obama) graduated from Plattsburgh High School in 1993. Plattsburgh is sometimes historically spelled as Plattsburg, leaving off the "h". Many historic documents relating to the famous naval engagement between the United States and Britain in 1814 refer to the Battle of Plattsburg. As a result, some history has been written using the latter spelling. For example, historian and former president of the Society of the War of 1812 in Illinois, John Meloy Stahl, published in 1918 "The Battle of Plattsburg: A Study in and of The War of 1812." In 1950 the editor of the New York State Legislative Manual, seeking to simplify the organization of that year's manual, requested a listing of state post offices from the United States Postal Service. Upon review of the listing, the difference in spelling was noted. The city was contacted and an investigation was begun by postal authorities. U.S. Postal Service records show that the name of the post office was changed to Plattsburg in 1894. During 1892–1894, the federal Post Office Department was growing at a rapid pace. The Postmaster General issued an order establishing guidelines for post office names for new post offices, including changing "burgh" to "burg". Subsequently, local postal officials changed the name of the village post office to Plattsburg. As a result of the 1951 investigation, the name of the city post office was changed back to Plattsburgh. At no time was the name of the city itself ever changed. To this day, some signs (including U.S. and Canadian highway signs, and a sign at the Plattsburgh Amtrak Station, among others) point the way to "Plattsburg". There is also a bank with plattsburg bank inscribed at the top. Plattsburgh is at 44°41′43″N 73°27′30″W﻿ / ﻿44.69528°N 73.45833°W﻿ / 44.69528; -73.45833 (44.695365, -73.458593). According to the United States Census Bureau,[when?] the city has an area of 6.6 square miles (17.0 km²), of which, 5.1 square miles (13.1 km²) of it is land and 1.5 square miles (4.0 km²) of it (23.40%) is water. Plattsburgh is on the western shore of Lake Champlain, in the northeastern part of the state of New York, just south of Cumberland Head. The Saranac River flows through the city into Lake Champlain. Plattsburgh is classified as a humid continental climate (Köppen Dfb) with very cold winters and warm, often humid, summers. As of the census of 2010, there were 19,989 people, 7,600 households, and 3,473 families residing in the city. The population density was 3,919.4 people per square mile (1,525.9/km²). There were 8,691 housing units at an average density of 1704.1/sq mi (663.4/km²). The racial makeup of the city was 89.88% White, 3.5% Black or African American, 0.38% Native American, 2.77% Asian, 0.03% Pacific Islander, 1.03% from other races, and 2.41% from two or more races. Hispanic or Latino of any race were 3.4% of the population. There were 7,600 households out of which 22.3% had children under the age of 18 living with them, 31.1% were married couples living together, 11.4% had a female householder with no husband present, and 54.3% were non-families. 40.4% of all households were made up of individuals and 13.5% had someone living alone who was 65 years of age or older. The average household size was 2.10 and the average family size was 2.83. In the city, the population was spread out with 16.5% under the age of 18, 27.7% from 18 to 24, 23.5% from 25 to 44, 18.1% from 45 to 64, and 14.1% who were 65 years of age or older. The median age was 30 years. For every 100 females, there were 86.4 males. For every 100 females age 18 and over, there were 83.7 males. The median income for a household in the city was $28,846, and the median income for a family was $46,337. Males had a median income of $35,429 versus $26,824 for females. The per capita income for the city was $17,127. About 13.6% of families and 23.1% of the population were below the poverty line, including 20.0% of those under age 18 and 13.0% of those age 65 or over. The government is headed by a mayor elected by a citywide vote and a council of six members, one elected from each ward. Colin Read (Democrat) is the current mayor of the city. He took office on January 1, 2017. The city is home to SUNY Plattsburgh, a liberal arts college which is a part of the State University of New York system and Clinton Community College, which Is also part of the SUNY System. SUNY Plattsburgh has been a part of the city since its founding in 1889 as the Plattsburgh State Normal School. Today, the college is host to about 5,500 undergraduates, 400 graduate students, and almost 400 faculty members. Students at the K–12 level who attend public schools in the city are served by the Plattsburgh City School District. The Plattsburgh Press Republican has a slightly more than 17,000 circulation. Plattsburgh Burgh has a reported circulation of 8,000. Plattsburgh has two television stations, WCFE-TV, channel 57, a PBS member station and WPTZ, channel 5, an NBC affiliate. Plattsburgh is part of a media market shared with Burlington, Vermont, which includes WCAX-TV (CBS, channel 3), WVNY-TV (ABC, channel 22), WNNE (CW, channel 31) and WFFF-TV (Fox, channel 44). Residents are also in the range of Montreal, Quebec, and other Canadian television stations. Some of these Canadian stations, including CBFT-DT, CBMT-DT and CFCF-DT, are available on Charter Communications, the cable franchise serving Plattsburgh. The city is about a 60-minute drive from Canada's second most populous city of Montreal, which is also the largest city in Canada's second most populous province of Quebec. Many people commute across the Canada–U.S. border, and the City of Plattsburgh advertises itself as "Montreal's U.S. suburb". New York state is Quebec's largest trade partner, with about $6 billion in trade annually. The proximity leads to Plattsburgh's prominence as a large trade center for a city its size. Interstate 87 bypasses Plattsburgh to the west, connecting Montreal with Albany and points south. Three main exits serve the city of Plattsburgh, with a fourth serving the Cumberland Head district of the town. U.S. Route 9 is a north-south highway crossing through the city on the east side. New York State Route 3 is an east-west state highway that enters the city from the west as Cornelia Street, intersects Route 22 and then ends at Route 9. New York State Route 22 is a north-south state highway that enters the city from the southwest and then turns north to run parallel to the west of Route 9. Part of Route 22 in downtown is a divided highway. New York State Route 314 is a short east-west highway on the north town line with the town of Plattsburgh connecting Interstate 87 with the Grand Isle–Plattsburgh Ferry to Vermont. Amtrak, the national passenger rail system, provides service to Plattsburgh, operating its Adirondack daily in both directions between Montreal and New York City. The closest American city larger than Plattsburgh is Burlington, Vermont, reachable via ferry or a bridge further north at Rouses Point. Ferry service is provided at Cumberland Head heading to Grand Isle by the Lake Champlain Transportation Company. There is also a seasonal ferry service offered by the same company in Port Kent, about 10 miles to the south. The latter ferry goes to Burlington. Plattsburgh International Airport uses the runway of the former Plattsburgh Air Force Base, which closed in 1995. The airport terminal was completed in February 2007 with the building being dedicated on April 27, 2007. Direct flights from Plattsburgh include flights to Washington-Dulles, Fort Lauderdale, Orlando, St. Petersburg, and others. Airlines flying out of Plattsburgh include United Express, Allegiant Air, and Spirit Airlines. Plattsburgh flight demand is driven by increased traffic from Montreal, Quebec. At approximately 80 to 85% of total yearly demand, Plattsburgh's airport markets itself as Montreal's US Airport, given it is closer to Montreal's South Shore Residents than Montreal-Pierre Elliott Trudeau International Airport, even with a 10 (workdays/Canadian side) to 20-minute (weekend/Canadian side) average border wait time. Cargo flights are offered by FedEx Feeder which delivers goods to more major airports aboard Cessna Caravans to be shipped on long haul flights and UPS which does similar service using ATR-72 turboprop aircraft. The city is serviced by the Clinton County Public Transportation, or CCPT for short. The county-wide bus service offers passengers city and county-wide bus routes, allowing passengers from surrounding communities to travel to and from Plattsburgh. These routes operate five days a week, with a citywide shopping shuttle offered on Saturdays. There is no bus service on Sundays or major holidays. For those going longer distances, Greyhound and Adirondack Trailways offers multiple daily trips towards Montreal and Albany. For the past three two-year cycles, the Plattsburgh Region was named as a Top 10 Micro City of the Future, in both North and South America, in FDis rankings. The FDi is a publication of the Financial Times of London and ranks cities across the world in various categories. In the year 2015, Plattsburgh obtained 2nd Place for Economic Potential, 1st for Human Capital and Lifestyle, 3rd for Business Friendliness, 9th for Connectivity, and 1st for Foreign Direct Investment Strategy. The largest employers in Clinton County are C.V.P.H. Medical Center, SUNY Plattsburgh, Clinton County Government, Wal-Mart and Sam's Club, Advocacy and Resource Center, City of Plattsburgh, and Swarovski Lighting. SUNY Plattsburgh contributes approximately $300 million to the regional economy each fiscal year. Other large companies in the area include: Bombardier Transportation which builds railcars in a 219,000 sq ft (20,300 m2) plant; Norsk Titanium, which opened its U.S. branch in Plattsburgh to make parts for the aerospace industry through the use of titanium rapid plasma deposition; and Nova Bus and Prevost which manufactures busses for the American market. Russell Banks' coming-of-age novel Rule of the Bone (1995) features a young criminal named Chappie, whose hometown is Plattsburgh. The crime film Frozen River (2008) was filmed in Plattsburgh and surrounding areas. A scene from the Joe Cocker documentary Mad Dogs & Englishmen was filmed in and around his April 7, 1970, concert at SUNY Plattsburgh. Some scenes from the film Escape at Dannemora were shot in the city of Plattsburgh. Peter Frampton sang and was recorded for some tracks of the best-selling album Frampton Comes Alive! on the campus of SUNY Plattsburgh on November 22, 1975. This Student Association-sponsored concert was held at Memorial Hall. In August 1996, the rock band Phish, which was based across Lake Champlain in Burlington, Vermont, held the first of its ten weekend-long festivals at the former Plattsburgh Air Force Base. The festival, called The Clifford Ball, attracted 70,000 fans from all over the country, making it Phish's largest concert up to that point and the largest rock concert in the U.S. in that year, and featured seven sets of music by the band. In September 2011, the British-Irish band One Direction filmed part of their music video "Gotta Be You" on the SUNY Plattsburgh campus. In the Mad Men season 5 episode "Far Away Places", Don and Megan Draper purportedly visit Howard Johnson's Restaurant and Motor Lodge in Plattsburgh, but the exteriors were actually shot in Baldwin Park, California. ^ a b Perkins, G. H. (1879). "Archaeology of the Champlain Valley". American Naturalist. 13 (12): 731–747. doi:10.1086/272452. ^ "History". Lake Champlain Maritime Museum. ^ User, Super. "History". www.rcdony.org. Retrieved September 30, 2017. ^ Chokshi, Niraj (December 12, 2013). "Religion in America's states and counties, in 6 maps". WashingtonPost.com. Retrieved September 30, 2017. ^ Allen, David (January 31, 2005). French Mapping of New York and New England 1604-1760. ^ "Zephaniah Platt". Zephaniah Platt. Retrieved on March 2, 2005. ^ Palmer, Peter S. (1987). History of Plattsburgh, N.Y. : from its first settlement to Jan 1, 1876. University Microfilms. pp. 47–49. OCLC 866165036. ^ "The Plattsburgh Sentinel, January 29, 1929". NYSHistoricNewspapers.org. Retrieved September 30, 2017. ^ a b c City of Plattsburgh. "History". Retrieved December 13, 2016. ^ "Bombardier United States - Sites and contacts". Bombardier.com. Retrieved September 30, 2017. ^ "Nova Bus Plattsburgh Factory". NovaBus.com. Archived from the original on May 14, 2011. Retrieved September 30, 2017. ^ "Michael Anderson: STS-107 Crew Memorial". Retrieved December 13, 2016. ^ Bergeron, Bryan (May 1, 2009). "Annable, 'off to a good start'". Cardinal Points. Archived from the original on May 25, 2009. Retrieved May 17, 2009. ^ "Dave Annable accepts the Off to a Good Start Award from SUNY Plattsburgh" (video). YouTube. Retrieved May 16, 2009. ^ Caudell, Robin (March 1, 2012). "Movie legend has Plattsburgh roots". Retrieved December 13, 2016. ^ Oller, John (August 28, 2016). "Jean Arthur Update". Retrieved December 13, 2016. ^ Campbell, Mary (March 23, 1987). "Tenor Rockwell Blake Is Bel Canto Specialist". Schenectady Gazette. ^ "Jesse Boulerice". Retrieved December 13, 2016. ^ "Jesse Boulerice #28". Retrieved December 13, 2016. ^ "Thomas John Carlisle Papers". Stlawu.edu. St Lawrence University. Retrieved August 24, 2018. ^ State University of New York at Plattsburgh. "Tom Chapin to Perform Concert at Plattsburgh State Oct. 18". Retrieved December 13, 2016. ^ Cummings, Robert. "John Henry Hopkins, Jr". Retrieved December 13, 2016. ^ "About Plattsburgh". Retrieved December 13, 2016. ^ Casey Ryan, Vock. "Hollywood actor, Plattsburgh native dies". Retrieved February 1, 2010. ^ "Bryan O'Byrne". Internet Movie Database. Retrieved February 1, 2010. ^ "David A. Stafford Papers - USMC Military History Division". USMC Military History Division. Archived from the original on August 1, 2013. Retrieved April 8, 2018. ^ Sengupta, Somini (November 6, 1999). "By the Way, a Mayor-Elect Is Gay". The New York Times. Retrieved July 22, 2016. ^ Morrison, Patt (June 13, 2001). "Wachs, Tuttle Have Earned Their Gold Watches". The Los Angeles Times. Retrieved January 7, 2016. ^ Moe, Todd (June 16, 2006). "Plattsburgh Native Wins Tony for Jersey Boys". Retrieved December 13, 2016. ^ Millard, James P. "The Battle of Plattsburg, September 11, 1814: Links, documents and resources". Retrieved December 13, 2016. ^ Millard, James P. "The Battle of Plattsburgh September 11, 1814". Retrieved December 13, 2016. ^ Stahl, John Meloy. "The battle of Plattsburg; a study in and of the war of 1812". Retrieved December 13, 2016. ^ "Postal History". USPS.com. May 9, 2009. Archived from the original on May 9, 2009. ^ "Files: 2010, 2000, and 1990". US Gazetteer. United States Census Bureau. February 12, 2011. Retrieved April 23, 2011. ^ "Climate Plattsburgh: Temperature, Climograph, Climate table for Plattsburgh - Climate-Data.org". en.climate-data.org. Retrieved January 13, 2018. ^ "Plattsburgh, NY (12901) Monthly Weather". The Weather Channel. Retrieved January 13, 2018. ^ "Plattsburgh Sentinel, June 21, 1889". NYSHistoricNewspapers.org. Retrieved September 30, 2017. ^ "U.S. News and World Report". RankingsAndReviews.com. Retrieved September 30, 2017. ^ "Clinton County Free Trader Today - newspaper in Plattsburgh, New York USA with local news and community events". www.MondoTimes.com. Retrieved September 30, 2017. ^ "Plattsburgh Press Republican - daily newspaper in Plattsburgh, New York USA with local news and events". www.MondoTimes.com. Retrieved September 30, 2017. ^ "Plattsburgh Burgh - newspaper in Plattsburgh, New York USA with local news and community events". www.MondoTimes.com. Retrieved September 30, 2017. ^ Harris, Sarah (June 21, 2013). "Is Plattsburgh Montreal's U.S. suburb?". North Country Public Radio. Retrieved July 20, 2013. ^ Agency, Government of Canada, Canada Border Services. "Border Wait Times". www.cbsa-asfc.gc.ca. Retrieved September 30, 2017. ^ "[#Miss Curieuse] : Plattsburgh vs Burlington vs Montréal - Profession Voyages". www.ProfessionVoyages.com. Retrieved September 30, 2017. ^ "Airports on the Border Make Room for Canadian Fliers". The New York Times. July 16, 2013. Retrieved September 30, 2017. ^ Douglass, Gary. "Chamber President". NCCC News. NCCC. Retrieved July 28, 2018. ^ Douglass, Gary. "List of Largest Employers in Clinton County". www.NorthCountryChamber.com. NCCC. Retrieved July 28, 2018. ^ "Economic Impact of SUNY Plattsburgh Tops $307 Million". State University of New York (SUNY) College at Plattsburgh. Retrieved July 25, 2018. ^ "Bombardier site fact sheet" (PDF). www.bombardier.com. ^ "Norsk Titanium's Plattsburgh Facility Will Be the World's First Industrial-Scale Aerospace Additive Manufacturing Facility - 3DPrint.com - The Voice of 3D Printing / Additive Manufacturing". 3DPrint.com. Retrieved September 30, 2017. ^ Strzepa, Liz (July 11, 2016). "Plattsburgh's Norsk Titanium facility to be world's first aerospace additive manufacturing plant". WPTZ.com. Retrieved September 30, 2017. ^ "Contact Us - Nova Bus". www.NovaBus.com. Retrieved September 30, 2017. ^ Crowe, Cameron (1976). Do You Feel Like We Do. In Frampton Comes Alive [CD liner notes]. Santa Monica: A&M Records. ^ Jacobsen, Neil (February 5, 1976). "Frampton Comes Alive" (PDF). Cardinal Points. Plattsburgh, New York. p. 5. Archived from the original (PDF) on July 23, 2011. ^ "The Student Asso's Concert Committee presents Peter Frampton" (PDF). Cardinal Points. Plattsburgh, New York. November 13, 1975. p. 8. Archived from the original (PDF) on October 5, 2011. Retrieved January 15, 2018. ^ The New York Times (August 18, 1996). "Small Adirondack Town Is Host of a Giant Concert". Retrieved December 13, 2016. ^ Bernstein, Scott (August 15, 2016). "Twenty Years Later: Phish Preps For Their Own 'Clifford Ball' With Soundcheck". Retrieved December 13, 2016. ^ Toulson, Ja’Pheth (September 28, 2011). "Building it up, breaking it down". Cardinal Points. ^ "Building it up, breaking it down". Cardinal Points. Archived from the original on December 2, 2013. ^ "'Mad Men' takes a trip to the North Country". WPTZ. 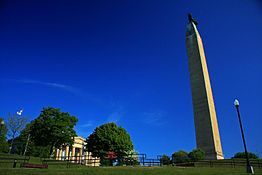 Wikivoyage has a travel guide for Plattsburgh. Wikisource has the text of the 1911 Encyclopædia Britannica article Plattsburg.